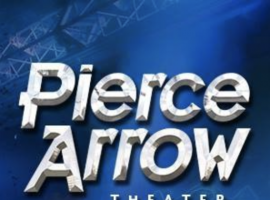 I gotta say, I don’t know how they do it, but Pierce Arrow just keeps getting better and better! I’ve been seeing this high-energy variety show for a couple of decades now. Specifically designed to showcase the superb four-part harmony of the group Pierce Arrow, along with the multi-talented band, this show wins in the MUST-SEE category every time. Whether you’re enjoying the matinee or the completely different evening performance, this show delivers. From classic country to new country, gospel to rock, oldies to today’s hits, you won’t find a better collection of favorites. And they change it up every year, so you can go back as often as you like without seeing the same old thing year after year. I love the style, the lights, and stage presence of all involved! Each personality gets a chance to shine. I decided a long time ago not to have a favorite here, because they’re all THAT GOOD! Travis Spratt has such a joyful spirit; it’s easy to see where he draws his Inspiration. And he’s gifted! When he sings, it’s like a little piece of Heaven right here on earth. Tony Turner. Enough said. But seriously, Tony is a show-stopper. His fan base continues to grow as his crazy antics, genuine fun-on stage, spot-on delivery of whatever he sings is endearing. Dan Britton is the founder of the group and is known for his bass singing. When he steps out on stage the crowd erupts! Scott Fraker is a real crowd pleaser as well. From his pleasant voice and warm smile to his calm demeanor, he anchors the group. Looking good and sounding good works for this group. Together, they really rock! And I haven’t even mentioned the comedian, James Sibley. This guy kinda grows on ya! At first the audience isn’t quite sure if he’s supposed to be on stage or not…then a few people start to chuckle and that gives the rest of the audience permission to laugh out loud. His off-beat characters are quite telling! This silly guy, along with the band leader Bobby Blackburn, who is hilarious in his own right (and a musical genius in my humble opinion) ends up rounding out an awfully good time at the Pierce Arrow Theatre. Don’t miss the rockin’ New Year’s Eve Party on Dec. 31, 2017 from 9:00pm-12:00am. Family-friendly entertainment, good time, hor d'oeuvres, party favors, giveaways, and a midnight balloon drop!